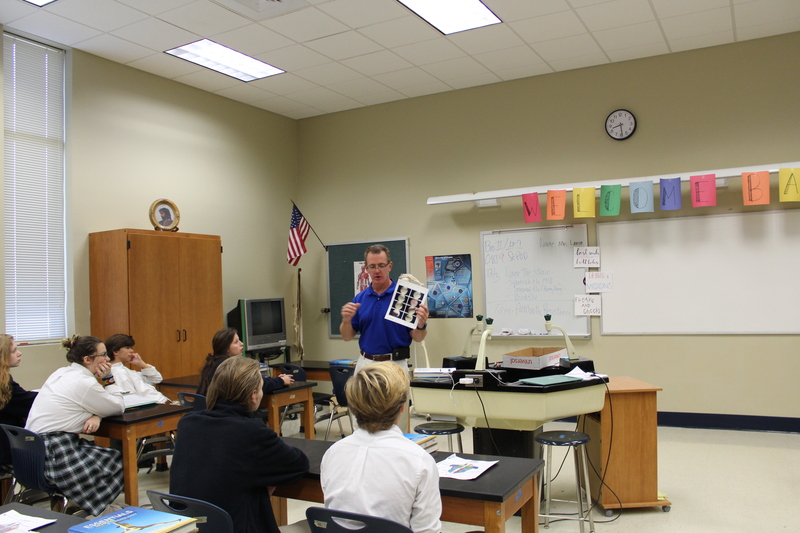 On Monday, December 3, Dr. James Thriffiley came to speak to Mrs. Lawson’s Human Anatomy and Physiology classes. Dr. Thriffiley is a Board Certified Orthopedic Surgeon who works at his office in Gulfport. Students in the Human Anatomy and Physiology class have been learning about different kinds of bones and muscles. Dr. Thriffiley talked to the students about his job and other careers in the medical field. Dr. Thriffiley brought several models of bones, ligaments, and tendons to show the students. He described what each model did and how he does surgery with each of them. Dr. Thriffiley also brought pins and screws that he has used in surgeries. He passed the models around to the students so that they could get a closer look at the models. The students loved to be able to look at the models up close to see what our bones look like. Dr. Thriffiley talked about how the technology of orthopedics and surgery have changed throughout the years. He showed the students how the material they are learning is used in everyday life. Dr. Thriffiley reinforced the information the students learned in a visual way. It was an interesting presentation that captured the attention of all the students. Many students asked questions about different topics that were talked about. Everyone found it very interesting how the human body can be capable of so many things. The students that are thinking about going into the medical field are now more interested. Dr. Thriffiley gave a great presentation to the Human Anatomy and Physiology classes.